Wiki Ed welcomed Dr. Zachary McDowell as its Student Learning Outcomes Research Fellow. Zach has already started his work, engaging with instructors in various academic fields to create criteria for his research into learning outcomes from Wikipedia assignments. Wiki Ed staff attended the American Society of Plant Biologists (ASPB) and the Allied Genetics conference, engaging dozens of instructors and students. At the ASPB event, Wiki Ed worked with biology students and Simons Foundation staff to organize an edit-a-thon for plant biologists. Wiki Ed launched a new online orientation to help instructors identify relevant articles for students to tackle in classroom assignments. This is part of an overall touch-up of the Dashboard, updating trainings and processes for instructors aimed at streamlining and clarifying our processes and best practices ahead of the fall term. We’ve also revised the language used on the course timeline, making it more directly relevant to students, and referencing the newly launched Editing handbook. Jami explains tools available to an interested instructor at the ASPB conference. 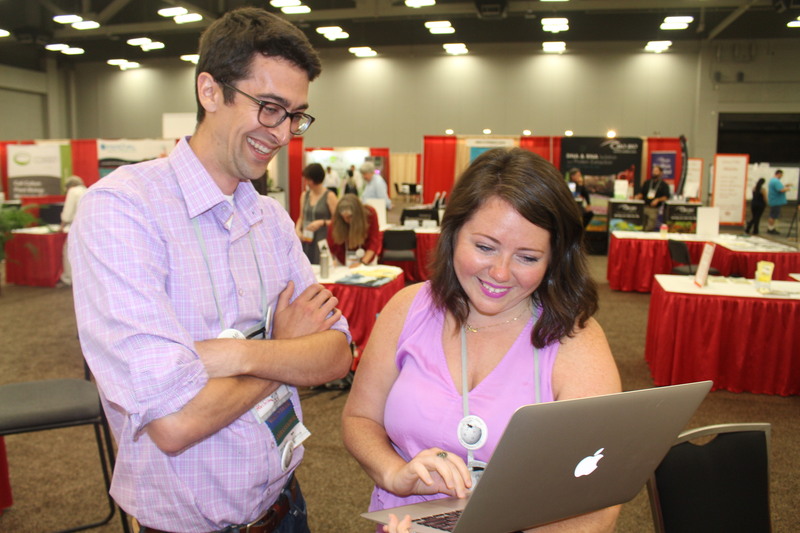 Educational Partnerships Manager Jami Mathewson and Outreach Manager Samantha Erickson joined plant scientists at the American Society of Plant Biologists’ (ASPB) annual meeting in Austin, Texas. They met with Dr. Sarah Wyatt’s students at Ohio University, who participated in the fall 2015 term of the Classroom Program. We were excited by the feedback we heard at the conference, such as this quote from Anne Sternberger, a PhD student in the course: “I always used Wikipedia growing up, but I never trusted it for actual biological information until I took Dr. Wyatt’s class and realized scientists contribute to it.” Anne and other students helped the Simons Foundation facilitate a plant biology edit-a-thon, training ASPB members to contribute to Wikipedia in their field of expertise. Jami attended the The Allied Genetics Conference in Orlando, Florida, where she encouraged geneticists and other biologists to incorporate a Wikipedia assignment into their curriculum. One geneticist observed that editors work together to create Wikipedia much like scientists work together in their scientific research, building off of the work of those who came before them. Assigning students to evaluate an article’s progress over the years can help students understand how knowledge, and science, is iterative and always changing as we make new discoveries. 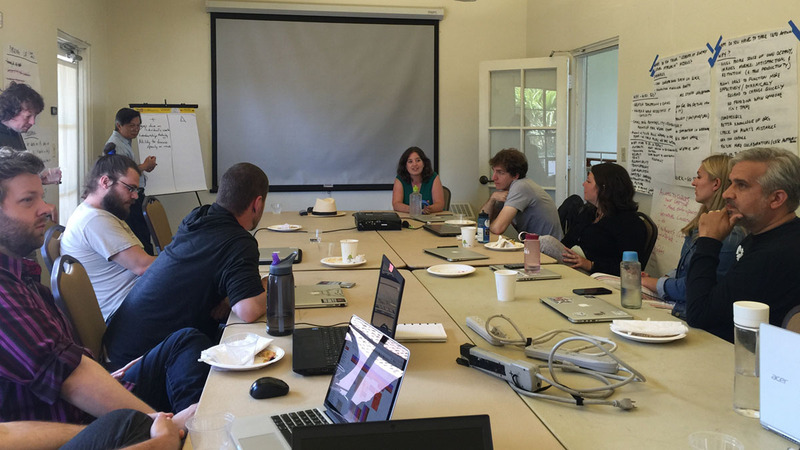 Samantha spent June advising new instructors on how to design assignments and utilize Wiki Ed’s suite of tools. In the last year, Wiki Ed has been involved in 40 outreach events, compared to 25 outreach events the previous year. Samantha has helped from recent workshops prepare as we enter the final term of the Year of Science. Students edited 273 articles and created 11 new entries. Last term was our largest and most successful term to date (215 courses with more than 4,000 students). The Classroom Program team is reflecting on that term to prepare for Fall 2016. However, not all is quiet on the Wikipedia front. We’re supporting 22 classes and more than 200 students in the summer term. Classroom Program Manager Helaine Blumenthal is working on ways to engage instructors during the term, as well as helping Research Fellow Zach McDowell integrate his research into our fall classes. The Wikipedia Year of Science is going strong this summer, and more than half of current courses are developing articles in STEM and the social sciences. We’ve so far supported 137 courses in the Year of Science and more than 2,300 students. In the six months since the Year of Science launched, our students have added more than 2 million words to Wikipedia in the sciences and worked on more than 2,000 articles. Our classes have improved Wikipedia in a range of science fields, ranging from the Sociology of Mass Media to Occupational Safety and Health. We’re eager to see what the fall term brings as the Year of Science enters its second half. This image, uploaded to Commons and added to the cork cambium article by students in the Biology 360 class, shows the tissue responsible for the formation of tree bark. Sundews use glandular hairs to trap insects. This image, which shows one of these hairs, was uploaded to Commons and added to the Drosera and carnivorous plant articles by students in the Biology 360 class. This image was uploaded to Commons and added to the resin canal article by students in the Biology 360 class. It’s been a quiet week in Lake Wobegon, but students in Timothy Henningsen’s Composition course at the University of DuPage have been busy adding to pages on chocolate makers, compression stockings, and Milton Glaser, designer of the iconic “I ♥ NY” logo. Composition courses like Henningsen’s typically work on a wide range of articles, adding sourced information to or improving the prose in dozens of different articles. Even relatively small contributions like those to this article mean that the article has had more information added in the last week than in the past eight years. Students in Naniette Coleman’s Sociology of Mass Media course continued working on whistleblower protection in the United States as well as our articles on nuclear whistleblowers. User:AshleyFortierUML, the student working on nuclear whistleblowers, identified that volunteers had worked on two very similar articles independently and was able to merge their work into an existing list article. Now new editors and readers who look for information on the topic can find it all at the right place. Mergers are very much a behind the scenes activity on Wikipedia and it is tremendous fun seeing students involved in and thinking about how information is constructed and presented on Wikipedia; very helpful when thinking about media literacy questions in general. George Mason University Visiting Scholar Gary Greenbaum brought the article Hawaii Sesquicentennial half dollar up to Featured Article status. We are happy to announce a new opening for a Visiting Scholar at the University of North Carolina, in the Department of Psychology & Neuroscience. Supporting this position at UNC is Dr. Eric Youngstrom, a professor who has also worked with our classroom program. He sees Visiting Scholars as a way to improve public access to accurate information about psychological assessment. “We are passionate about putting the best information where the most people will benefit,” he told us. “People are not helped when their problems are misdiagnosed, and may be hurt due to side effects, the expense and burden of inappropriate treatment, and delays in getting helpful treatment.” You can read more about this opportunity through this post on our blog. One of the strengths of the Visiting Scholars program has been working with seasoned Wikipedia editors who use their experience to improve article quality in ways that new users mind find difficult. Wiki Ed’s annual plan further emphasizes that strength by tracking article quality rather than quantity, setting goals in terms of articles improved to B-class or better. B-class designates a level of quality that only 2.7% of articles have achieved. Visiting Scholars have been producing high-quality content since the program began, with several articles already promoted to B-class, Good and Featured (the top quality designation on Wikipedia). 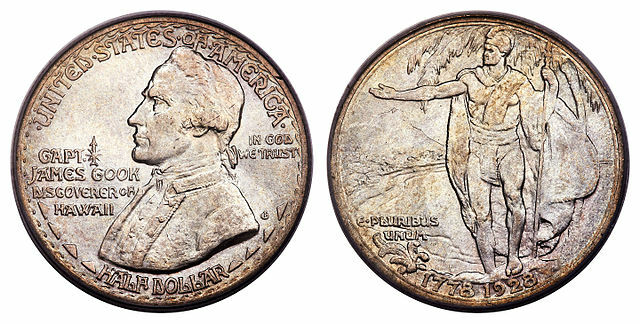 This month, for example, George Mason University Visiting Scholar Gary Greenbaum brought the article Hawaii Sesquicentennial half dollar up to Featured Article status. Communications Manager Eryk Salvaggio has worked with staff to complete several projects for the fall 2016 term. First, Eryk worked with Wikipedia Content Expert in the Sciences Ian Ramjohn to draft a new online orientation module for instructors. This module will help them create a list of Wikipedia articles for their students. It covers a variety of methods for finding and identifying articles that need improvement within a set topic area. The training is already online and open to anyone. Eryk has been collaborating with Classroom Program staff on an ongoing project to improve the clarity of information provided on the Dashboard and on instructor’s course timelines. These timelines focus on the student editor, with clear signals of expectations and milestones evident to the instructor. The new timeline includes more specific references to Wiki Ed’s updated Editing guidebook, and includes a series of optional questions aimed to engage students to think deeply about Wikipedia. These questions were drawn from several resources, including our Theories handbook. Finally, Eryk worked closely with Helaine and Samantha to create a single start page for interested instructors. 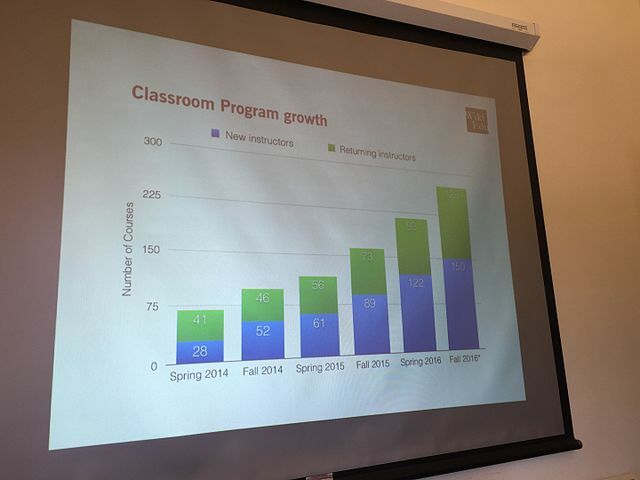 Until now, outreach to new instructors included a wide collection of links in an e-mail. The new teach.wikiedu.org page gives greater flexibility to new instructors to research more about the expectations of teaching with Wikipedia, to explore our resources, or to go on to the orientation if they’ve already made up their minds. A July 5 blog post, “How Geobiology came to Wikipedia,” was among our most-shared posts of all time. The post tells the story of one Caltech student, Alice Michel, and her work to improve the Wikipedia article on her major, Geobiology. The article was a few scarce sentences and is now a quality doorway to the field, and sits among the top-three web results for Geobiology on Google. Work also began with Dr. Amin Azzam’s interns at the University of California, San Francisco. These interns are medical students working with Dr. Azzam to help improve the training experience for medical students who edit Wikipedia. Elizabeth De Wolfe publishes guest blog for Wiki Educational Foundation on women and gender studies student projects showing ‘Wikipedia’ articles to be male-centric University of New England Faculty and Staff News (July 5). This month in digital infrastructure, Product Manager Sage Ross focused on preparing the Dashboard for the Fall 2016 term. We completed a significant update of the timeline content produced by the Dashboard’s assignment design tool, paring down the number of distinct resources and adjusting the in class portions to be a better fit for most new instructors’ syllabi. Sage also began working with Zach to prepare for using the Dashboard survey tool for a study of student learning outcomes. The main focus for the summer continues to be on improving the long-term maintainability of the Dashboard and its accessibility to new developers, through enhancements to our suite of automated tests and updates to the open source components we use. This month has been spent focusing on Data Science Intern Kevin Schiroo’s primary goal of characterizing the type work performed by students. We have a theory that Wiki Ed students contribute a substantial portion of all academic work contributed to Wikipedia. To test this, Kevin developed tools for classifying articles as academic or not-academic. He developed a classifier, which classifies a single reference (or source) as academic or non-academic. A random sample of ~600 references was drawn from articles on Wikipedia and hand labeled. While selecting references he chose to select only those that utilize the citation template. These provide significantly more information and have a much more amicable structured compared to their free text counterparts, which can often be difficult to accurately classify even with direct human review. After references were labeled, he transformed them to associate structural information of the citation template with words contained within the reference. These transformed references could then be easily fed through standard vectorization algorithms for document classification that use a “bag-of-words” approach. The resulting vectors were then used to train a machine learning module (linear svc). The resulting model proved to be reasonably accurate in classifying unseen references. Kevin selected a subset of articles that we labeled last month and calculated the ratio of academic references to general references for each using this classifier. Since labeling is still in progress, he selected all articles that had been labeled by two staff members and both staff members were in agreement. 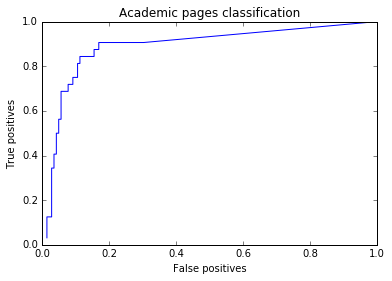 The articles were used to test the performance of a new page-level classifier (classifies a page, rather than a reference) utilizing the reference ratio as its only feature. Plotting true positive and false positive rates against each each other, Kevin found 0.13 to be a reasonable threshold. This unexpectedly low threshold tells us that academic references, and those that look similar to them, are infrequent on the encyclopedia as a whole and especially infrequent within articles that are not academic. This method shows promise as a means to validate or refute our theory of student contribution. In July, we welcomed Dr. Zachary McDowell as our Student Learning Outcomes Research Fellow. Zach has already interviewed and set the stage for collaborating with more than a dozen experts in various fields, from Writing Programs, to Composition and Rhetoric, Educational Technology, Information Literacy, and Curriculum and Faculty Development. These interviews form the backbone of his work on improving criteria for researching learning outcomes from Wikipedia assignments. That work includes identifying appropriate outcomes to assess, how to assess them, and how to contextualize those assessments using qualitative data. Zach has been working the last month to create new and re-package Creative Commons licensed survey, assessment, focus group, and other required documents for the research protocol. The research protocol has been submitted to UMass Amherst’s Human Research Protection Office / IRB (by Zach, as he is also an affiliate of UMass Amherst). July is the start of another new fiscal year. We were able to carry roughly $500k from last fiscal year into this year. 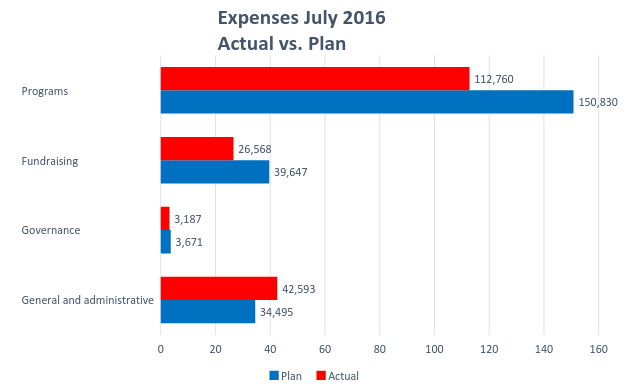 Our expenses for the month (and year-to-date) were $185,107 versus the approved budget plan of $228,643. The variance of $43k was due to delaying the start of a visibility campaign until later in the year. Talks are underway with Greg Boustead of the Simons Foundation and representatives from Philanthropy New York (PNY) to discuss ways to showcase the Year of Science and the Simons Foundation / Wiki Education Foundation’s partnership among PNY members. Philanthropy New York represents more than 280 grantmaking organizations in New York City and beyond. In late July Tom Porter attended a Development Executives Roundtable continuing education workshop focused on major gifts solicitation strategies and tactics. Planning also began a series of East Coast donor cultivation meetings scheduled for mid-August. In July, Development Associate Victoria Hinshaw left the organization. We wish Victoria well on her future endeavors, and thank her for all her hard work at Wiki Ed. Discussion during the July all-staff meeting. Traditionally in July, we hold one of our semi-annual all-staff meetings in San Francisco. With the new fiscal year getting started, one of the goals of the gathering is to create alignment around the new Annual Plan. Staff developed a shared understanding of team mandates and key focus areas for next year. In addition, we engaged staff in a conversation about “leadership across the organization.” This included group discussions about the potential benefits of the concept, about what to take into account when acting as a leader at their level, and about what it takes to establish a culture of leadership at all levels. The July all-staff meeting is also a time for reflecting on past achievements. Director of Programs LiAnna Davis, Jami, and Executive Director Frank Schulenburg provided their direct reports with performance reviews for fiscal year 2015–16, and had discussions about how to work even more effectively with each other and how to remove potential roadblocks. A large part of the all-staff meeting was dedicated to the sharing of learnings. Individual staff members presented their reflections, including “Learnings from recruitment” (Jami), “Visiting Scholars” (Ryan), and “Student learning outcomes research” (Zach). Also, for the last official day of the meeting, we organized an optional peer-learning morning, where staff members offered short lectures and discussions on work-related topics (e.g. project management, writing a blog post, Wikipedia special pages, etc.) The week-long all-staff meeting concluded with a visit to the San Francisco Exploratorium, in line with our ongoing Year-of-Science initiative. In July, Executive Assistant to the ED Renée LeVesque left the organization. We appreciate her hard work and wish her all the best. Also in July, Frank traveled to Boston and met with our partners at the Stanton Foundation to discuss the current status of the Wiki Education Foundation and the road ahead.